Girls volleyball team from College Heights Secondary School was en route to the provincial high school championships in Powell River. 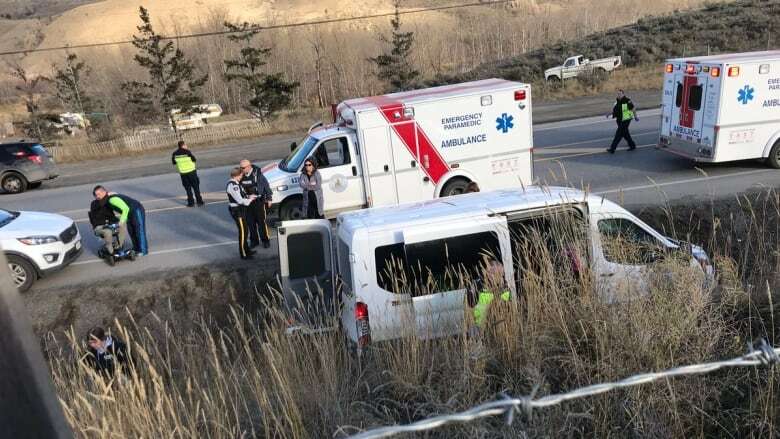 Four Prince George students who were on a school shuttle bus that crashed near Cache Creek Tuesday remain in hospital with non-life threatening injuries, according to the RCMP. The bus carrying 16 and 17-year-old girls from College Heights Secondary School volleyball team was en route to Powell River to compete in the provincial AAA high school championships. RCMP Cpl. Mike Halskov said the bus veered to avoid something on the road and drove into the ditch. Initial reports from B.C. Emergency Health Services said 12 people had been injured and eight taken to Royal Inland Hospital, but Halskov said that information was incorrect. A number of ambulances and one air ambulance attended the crash scene. Some of the injured were treated on site. "In the grand scheme of things we are fortunate that we've had no fatalities. It's scary for all of us," said Prince George school superintendent ​Marilyn Marquis-Forster. Marquis-Forster said the parents of the players were making their way to Kamloops.